Clemson is back in the College Football Playoffs, this time set to face Notre Dame in the Cotton Bowl, Below, get prediction, time, TV channel and preview information. The Tigers and coach Dabo Swinney are looking to win a national title for the second time in three years. The Irish, led by coach Brian Kelly, are going for the program’s first national title since 1988. A win would bring one of these teams one one away from adding to their championship trophy case. 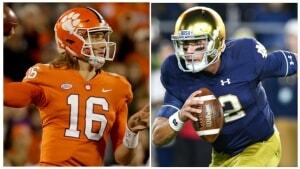 Clemson and Notre Dame battle in a College Football Playoff semifinal at 4 p.m. ET on Saturday, Dec. 29. The game is on ESPN. Clemson is back in the College Football Playoff, reaching the semifinals for the fourth consecutive year. Though Notre Dame played for a national title in the 2012 season, this marks the Irish’s first appearance in the CFP. That history and the statistics suggest the Tigers will be huge favorites to win — and possibly set up another showdown with Alabama. Notre Dame has wins over ranked Michigan and Syracuse, but four of its 12 wins were decided by a touchdown or less. It wouldn’t be too surprising if some of the questions remain from those lingering skeptics from 2012, when 12-0 Notre Dame lost to Alabama 42-14 in the BCS National Championship Game (a season that Notre Dame later had to vacate all the wins). But the Irish are 12-0 again — and are again big underdogs. On paper, Clemson has to feel confident. The Tigers averaged almost 74 yards per game more than Notre Dame and allowed 54.8 fewer yards as well. Ian Book has played well in key moments for the Irish, but Clemson freshman Trevor Lawrence has already emerged as one of the top quarterbacks in the country. RB Travis Etienne, at almost 1,500 rushing yards, also gives Clemson an edge. But the biggest strength on Clemson is the defensive front. End Clelin Ferrell and tackle Christian Wilkins were both named to The Associated Press All-America first team this season. As the clear underdog, Notre Dame will embrace the doubters and the questions. But Clemson is Clemson. A showdown with Alabama seems to be inevitable going into the semifinals. A late touchdown by the Tigers will put the Irish away for good.